8744 ft (2665 m) . Although Diamond Peak is certainly not one of the more well-known Cascade volcanoes, its bulky profile is nevertheless prominently visible from viewpoints along nearly the entire length of the Oregon Cascades, from Mount Jefferson all the way south to Mount McLoughlin. 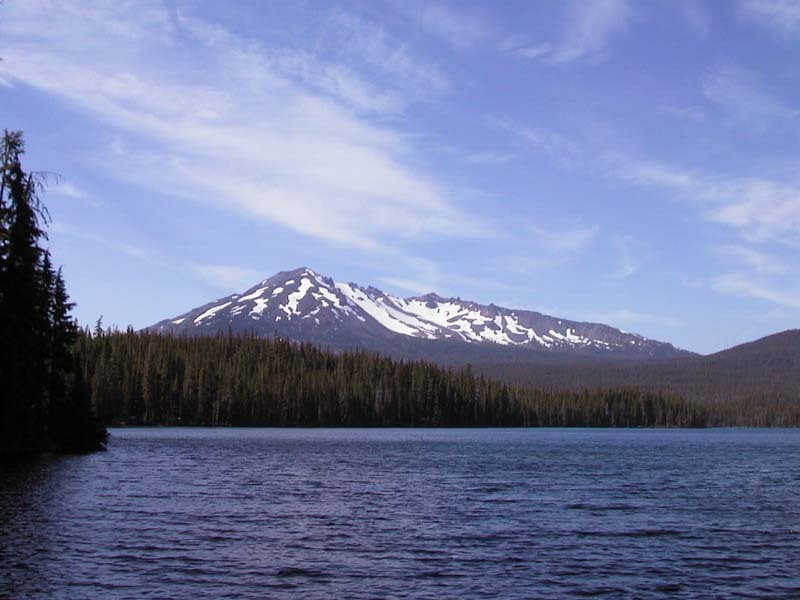 Like so many of the Oregon volcanoes, Diamond Peak is a shield volcano, which is in somewhat of an intermediate state of erosion compared to nearby Mounts Bailey and Thielsen. Huge cirques have been carved into the northwest, northeast, and southeast sides, removing all traces of any summit crater and dividing the summit area into a number of peaks connected by rotten, pinnacled lava ridges. In the largest two cirques on the northwest, the inner core of the volcano has been well exposed, revealing a variety of lava flows and intrusive conduits. Diamond Peak is located somewhat farther west than most other Oregon volcanoes and is directly on the Cascade Crest, resulting in heavy snowfalls and a deep snowpack which lingers on many aspects into midsummer. Despite its modest elevation, it supports several permanent snowfields (glacial remnants) in the deep recesses of the northwest cirques, which were likely active glaciers less than a century ago. Diamond Peak is the most remote of the Oregon volcanoes, with western approaches requiring over 20 miles of forest service roads from Highway 58 and eastern approaches about 10 miles by trail from the highway at Willamette Pass. 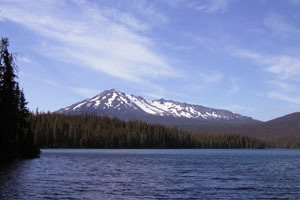 (13 km) The shortest access to Diamond Peak is from the Corrigan Lake trailhead on the southwest side, where a number of forest roads skirt the edge of the designated Wilderness. The west ridge and southwest face are an excellent day trip in spring, and a fine overnight trip even in winter, when access requires skiing several extra miles of road. However, its combined windward and sunward exposure results in rapid loss of snowpack, and the nicely-pitched upper slopes are typically bare well before the end of spring. A much better choice then is to descend via the huge cirque of the Northwest Bowl, which holds its snowpack exceptionally well. Upper portions of the bowl are quite steep, and often have large cornices and near-vertical walls of windsculpted snow along the edges. This route does require a long flat/upward traverse near 6000 ft to return to the trailhead. An alternate approach in late spring is to start from the Bear Mountain trailhead, which saves 1000 ft of elevation gain at the expense of a couple extra miles of easy trail. (16 km) The excellent spring skiing in the Northwest Bowls can also be reached from the Hemlock Butte area to the northwest of Diamond Peak. This area offers the shortest road approach and most direct line into the bowls, at the cost of some extra skiing or hiking distance. However, this route eliminates the long traverse needed at the end of the descent to return to Corrigan Lake. In spring, this is also the shortest approach to the Northwest and North Ridges, which offer a longer but gentler route which traverses the entire summit ridge of Diamond Peak. 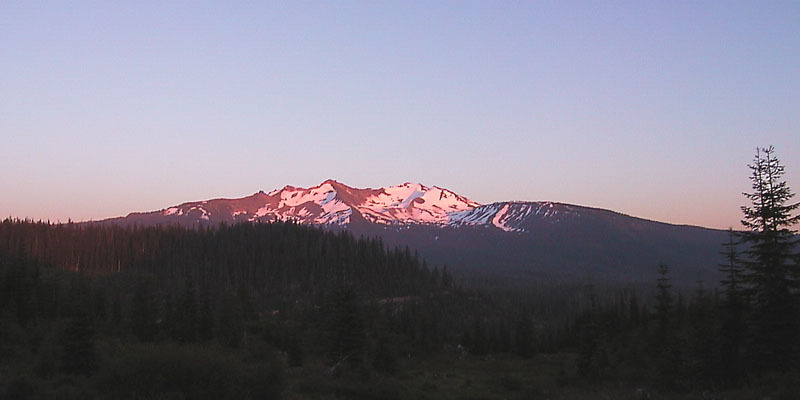 (34 km) This long route follows the Pacific Crest Trail southwest from Willamette Pass, and during winter and early spring is the shortest access to the north and east sides of Diamond Peak. After several miles of gently rolling ascent, the trail leads to timberline just south of Mount Yoran, a prominent eroded volcanic horn at the base of the northwest ridge. This ridge leads directly to the north summit, and a short descending then ascending traverse leads to the south (true) summit. For the descent, a much steeper option is to ski the northeast face, although in early season the avalanche hazard may be severe on this leeward, wind-loaded aspect. (16 km) From the summit of Diamond Peak, the broad Southeast Bowl is a tempting-looking descent, with a steep pitch and numerous skiable lines amongst a series of large lava pinnacles. However, returning to the standard Corrigan Lake trailhead after this descent involves a very long and flat traverse. A better option if planning this descent is to start from the Marie Lake trailhead, and ascend the South Ridge, which leads very directly (but not too steeply) to the true summit. Descend either along the ascent route or by dropping east into the Southeast Bowl, whereby a gentle descending traverse easily returns to Marie Lake. Upcoming additions: Topographic map showing ski routes. | Sunset view of Diamond Peak from the northwest near Hemlock Butte in July. | Panoramic view looking south from the summit of Mount Bachelor in June. digitally composited from four photographs.